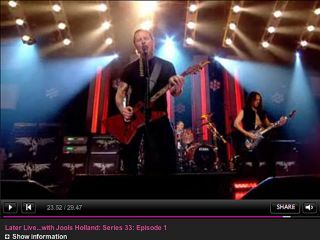 Metallica performed material from their new album Death Magnetic live on television for the first time last night. Live on BBC2 in the UK, the band performed lead single The Day That Never Comes on Later Live...With Jools Holland . Kings Of Leon and French First Lady Carla Bruni also featured on the show. An extended version will be broadcast on Friday night at 11:35pm BST with performances of Death Magnetic track Cyanide and the band's 1991 classic Enter Sandman also due to be aired. Reaction to the performance on fan forums seems mixed with some people complaining about the guitars sounding out of tune in the clean passages of the song, and others accusing singer James Hetfield of sounding a little hoarse. To see last night's show in its entirety, check it out on the BBC's iPlayer. If you only want to see the Metallica performance, inevitably some cheeky scamp has ripped it and posted it on YouTube.